We’ve been in Malta for over 7 months now, and the time has finally come. 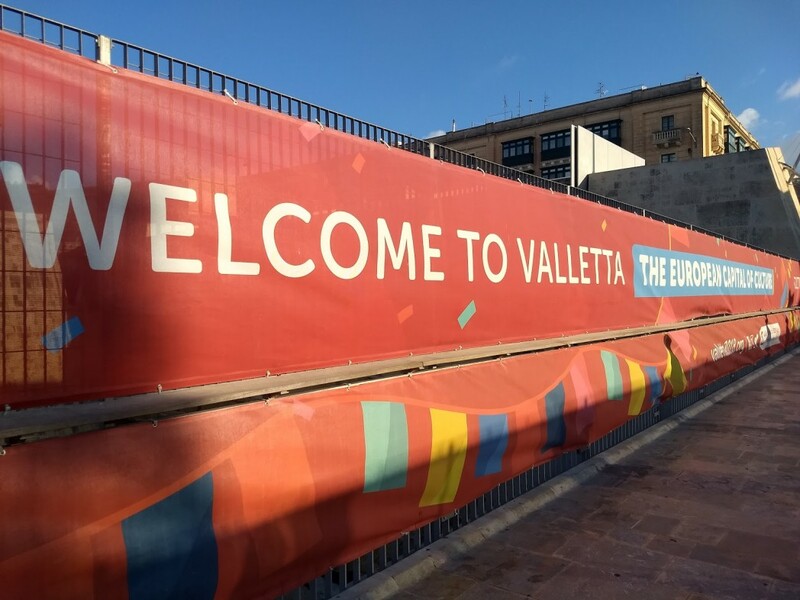 The Valletta 2018, European Capital of Culture is here! The big launch party was on Saturday 20th but there were events happening all over the city in the run up to it too. The main event kicked off on the 20th January, when, according to Mario Philip Azzopardi (the Valletta 2018 artistic director for special events), the city was turned into “a venue for spectacular international performances and street entertainment featuring local artists, musicians, singers and dancers, all contributing to a festa for all”. 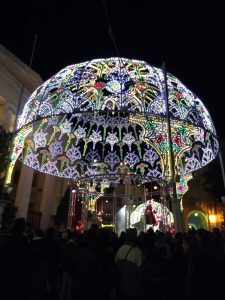 According to Valletta 2018, the programme aims to weave traditional Maltese crafts and traditions with innovative new technologies and concepts. The opening celebrations took place across four different plazas. Roads were closed and visitors entered the city by foot through specific entrance points. The Triton Fountain at the City’s main entrance, which had been undergoing a very lengthy restoration, was finally completed the week before, just in time for the launch. On the night, we entered the city by the fountain at around 9.30pm, and, passing some aerial acrobats setting up for a performance, we joined the crowds shuffling in through the main gate. It was so busy crossing the narrow bridge that it seemed like we could all have been crushed but thankfully we all kept moving at a slow and steady pace and made it through. If it was a bit nerve-wracking for us, it definitely wasn’t very accessible or safe for those in wheelchairs or with children in buggies. Once across the bridge, large video screens explained what was on, when, and where. There were shows on the hour every hour. 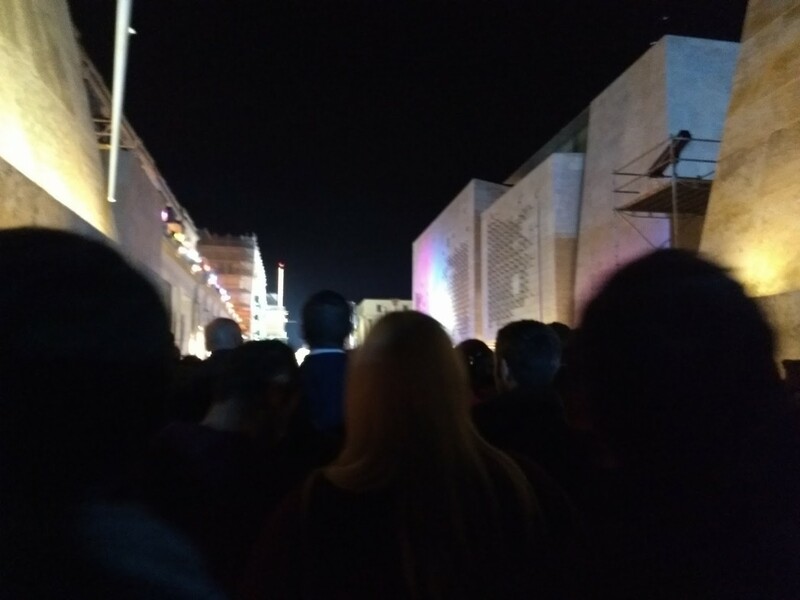 We walked along the main thoroughfare of Republic Street where there was a stage set up by Pjazza Teatru Rjal, Malta’s outdoor theatre, with presenters hosting a live feed of the nights activities. The first performance we came across featured dancers on swings, dressed in baroque costumes, swinging to music, under a very ornate lit up dome. It made a good instagram worthy pic, but the crowds were pressing, and we kept walking. 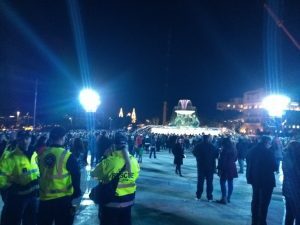 After that, we came to St George’s Square, a bigger plaza, which had a large pyramid stage, with projected visuals and a contemporary dance performance called Qalbna. 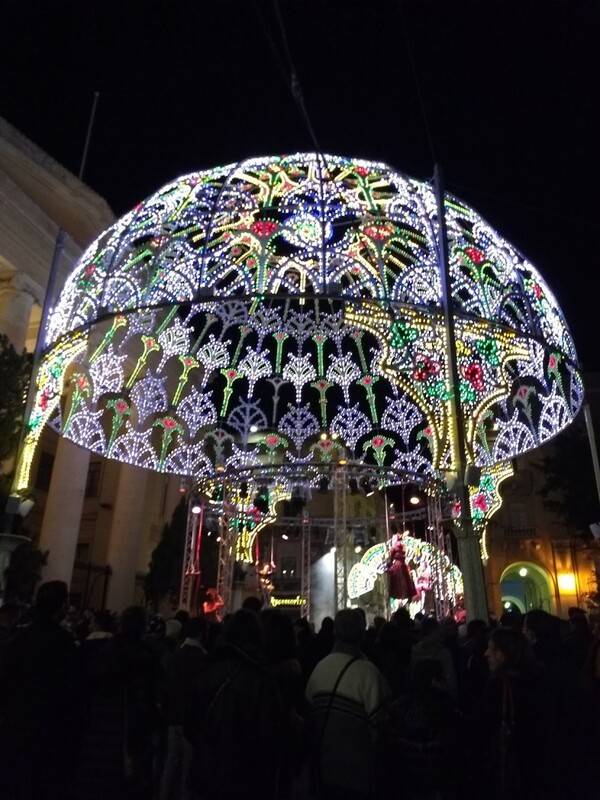 It was performed by ŻfinMalta, Malta’s National dance company, with original musical compositions by Cyprian Cassar. It was so crowded at this point we couldn’t see the stage. We tried our best to weave closer to the front but the only place with space to stand was behind the technical tent so we retreated and continued walking on to the next event. Around the corner we walked right into the middle of a marching brass band, which grew in size as passers by joined in, dancing with the music as they went. The local bars and cafés that lined the streets had all set up little stands outside their businesses selling snacks and drinks. We picked up a bottle of Cisk beer, and continued walking. There was a food tent up at the next square selling pastizzi pastries, risotto, and freshly made pizzas while you wait. We tried the risotto, while watching a 3-D mapped video projection on the facade of the Auberge de Castille, which houses the offices of the Prime Minister of Malta. The video piece was called ‘From the Depths of the Past to the Heights of the Future’ by artist Duane Luas. The text was in Maltese but video told the history of Malta through the ages and on to its imagined future. It was particularly funny to spot the recap of the period of British rule, summarised by the trademark red phone booths and the Malta Post Service. This video piece finished with a firework display above the Auberge, and we moved on to our last event of the night. 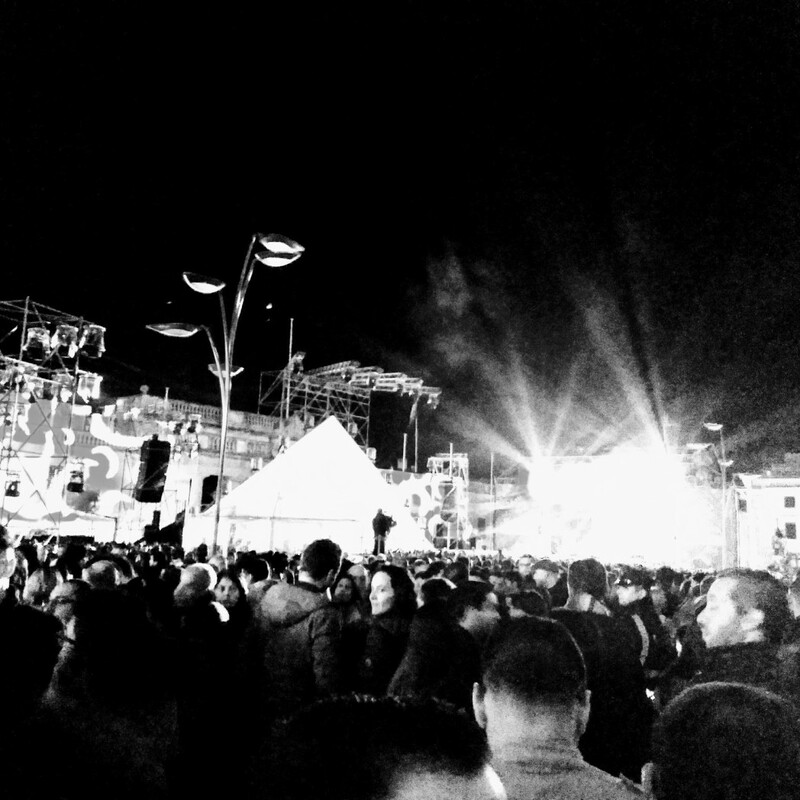 The closing event/afterparty of the night was TEMPO, an electronic dance music concert by famous Maltese DJ Tenisha (Joven Grech) and the Malta Philharmonic Orchestra. The concert included covers of songs by Depeche Mode and Pink Floyd, but reworked into dance/trance variations with a full orchestra accompaniment. It was an interesting combo, that worked well, and the crowds with their neon flashing gloves and glowsticks seemed to really enjoy it. There were more fireworks to follow. Over 110,000 people were said to have attended the festivities, that’s over a quarter of the whole country’s population, which is an amazing indication of the popularity of the event. Reactions to the event have been mixed, with many people complaining that overcrowding and logistical issues ruined an otherwise great event. Others complained that some elements had been shown internationally elsewhere already. Even more have been complaining that the Maltese just love any excuse to complain (they’re not too dissimilar to the Irish!). We were personally very glad we lived within walking distance of the city, as we witnessed scenes of absolute chaos as people tried to make their way home after the event. People were pushing and shoving each other to get on packed buses, crowding out onto the middle of the roads, arguing, fighting, banging on bus windows. Some waited for hours on buses that never came at all. Overall the night felt like being at a music festival where the festival encompassed the whole city. It was busy, loud, chaotic, and generally very Maltese. Logistical issues meant that it wasn’t really accessible for all, but was certainly a good festa for all able bodied adults with comfortable walking shoes. Our own Galway 2020 Capital of Culture will launch in 2 years time, and we couldn’t help wondering how it will compare. I can imagine Macnas are already booked to take part, and there will probably be stages set up in Eyre Square, the Spanish Arch and Fisheries field, maybe a big concert out in Salthill too. It will be fun to see how both events weigh up against each other.